Reporting from Beirut— A gas leak and not sabotage caused an explosion Tuesday at a newly inaugurated section of an oil refinery in Abadan just before President Mahmoud Ahmadinejad spoke at the ribbon-cutting ceremony, state media reported. But Ahmadinejad quickly drew criticism from a lawmaker and some staff members at the refinery who suggested that the facility in the southwestern city was launched too soon, a semiofficial news agency reported. 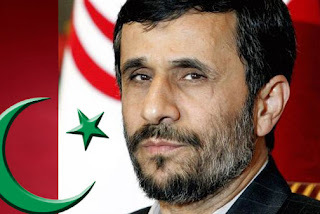 The blast, which killed as many as four people and injured up to 25 more, did not halt Ahmadinejad's speech, which included fairly typical denunciations of U.S. relations with Middle East autocrats and the course of the Israeli-Palestinian peace talks, according to news agencies. He did not mention the explosion during his 20-minute speech. The gas leak that caused the explosion and subsequent fire also sickened some oil workers, Mehr News Agency reported. Iran's industrial sector has long been riddled with deadly accidents, from train and plane crashes to troubles at petrochemical facilities. The government also is seeking to put down an uprising in the southwest by the country's ethnic Arab minority, which was inspired by pro-democracy movements across the Middle East and brutally crushed by authorities, which led to initial concerns that the blast might have been an act of sabotage. In a sign of the harsh infighting that has come to characterize relations between Ahmadinejad and his rivals, officials all but accused Ahmadinejad, who had recently appointed himself caretaker oil minister amid howls of protest by his many political opponents, of rushing to open the plant too early in order to ingratiate himself with Iranians. According to the semiofficial Fars News Agency, "managers and staff of the refinery have said this incident was a natural occurrence because the refinery was not technically prepared for inauguration and its third phase was inaugurated hastily, after some unsuccessful attempts were made a night before the incident to adjust and prepare [the refinery] for inauguration." Hamid-Reza Katouzian, head of parliament's energy committee, also told Fars that experts had warned officials that the Abadan facility was not ready to launch. The addition to the refinery will eventually produce 1.5 million gallons of gasoline a day to help satiate Iran's energy-hungry consumers.